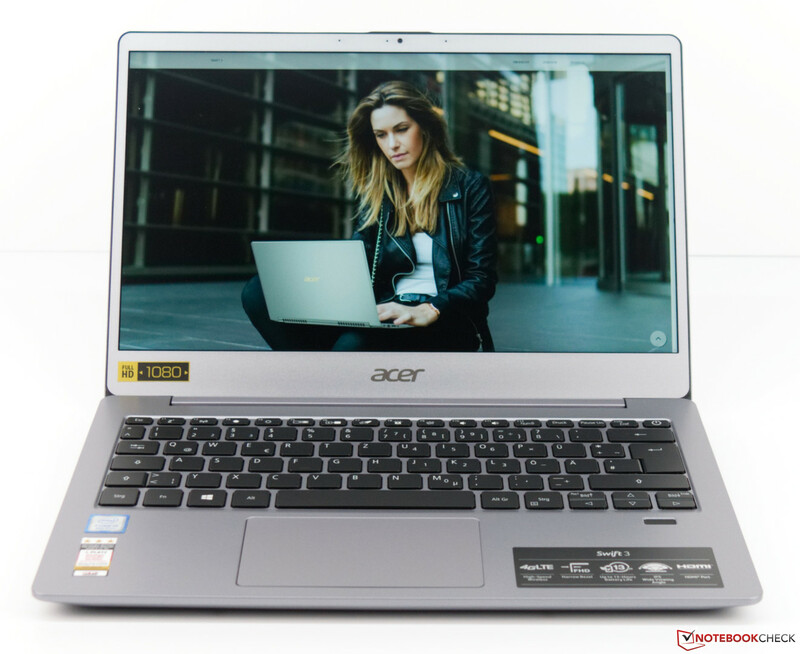 The Acer Swift 3 SF313 is a compact 13.3-inch subnotebook that offers decent computing power thanks to its Intel Core i5-8250U processor and its 8 GB of LPDDR4 RAM. 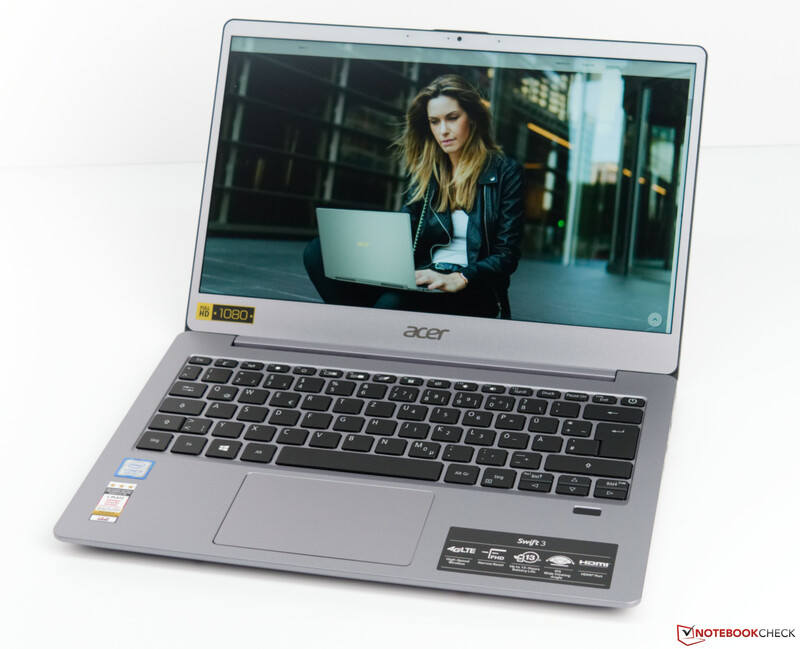 Acer also sells the compact travel companion with an Intel Core i7-8550U CPU and a 512 GB SSD should you need more horsepower and a larger system drive. Our test device is available for 1,019 Euros (~$1,169) at the time of writing and is also the base model of the Swift 3 SF313. The device comes with a 256 GB SSD in addition to its Core i5-8250U processor. However, the SSD utilises the NVMe protocol, which yields fast read and write speeds. Unfortunately, there are no alternatives for RAM other than the 8 GB LPDDR4 in our test device. Users that regularly travel for work will appreciate the convenience of an LTE modem though. Acer also sells a cheaper non-LTE version too if you do not need the additional connectivity that having an LTE modem brings. Overall, the Swift 3 SF313 offers a solid base to master everyday office work. We have subjected our test unit to our usual tests to determine whether it can match its paper specifications though. We have chosen five comparably priced subnotebooks against which we will compare the Swift 3 SF313. We included an overview of our comparison devices below. 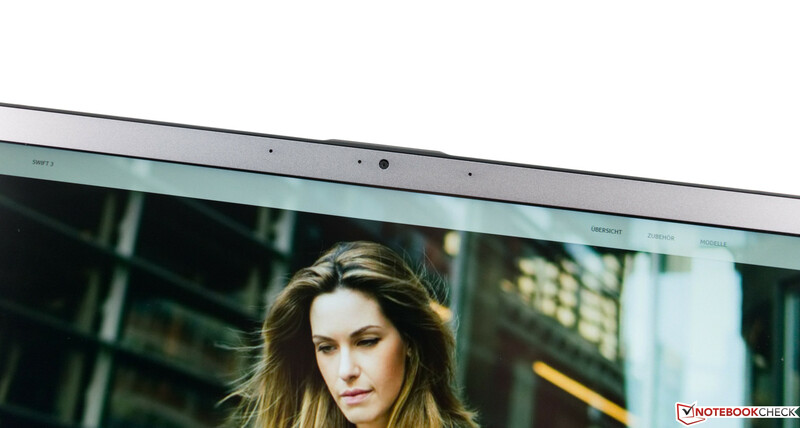 At first glance, our test device looks premium and timelessly elegant with its silver finish. 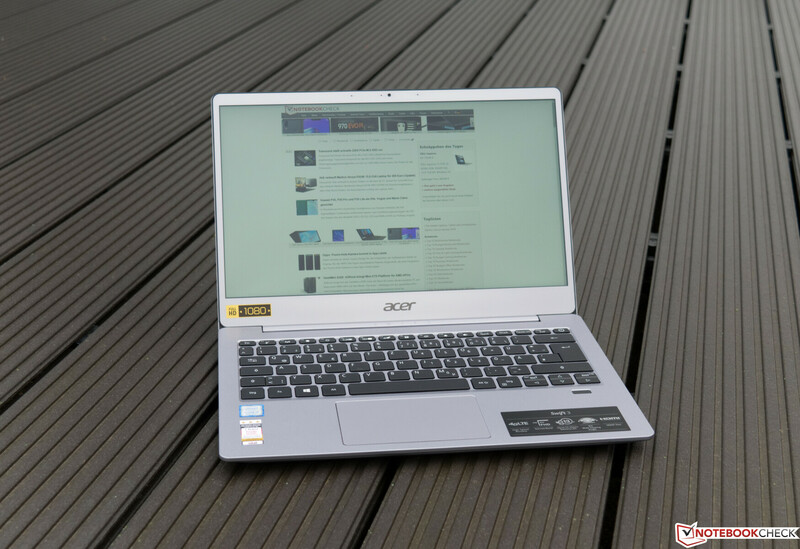 We are torn though because Acer has mainly constructed the Swift 3 SF313 using plastic. The surfaces on our test unit are smooth and grippy. An aluminium case would have been better in our opinion as it would have resulted in the SF313 feeling sturdier than it does. Stability is not a big issue though thanks to its compact design. Despite being mainly plastic, our test device is quite stable at the edges of its frame, but it does bow when we press the keyboard deck hard. Moreover, we can twist the case without much effort, during which we can hear quiet cracking noises. Additionally, we found the display lid easy to twist, but it can withstand pressure well with the screen not deforming no matter how hard we applied pressure to the lid. The display frame is surrounded by a black rubber lip, which acts as a small buffer between the case and the display lid when the screen is closed. 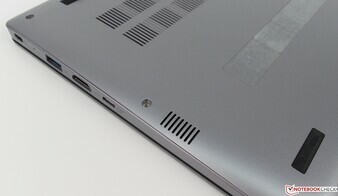 Acer has also included a small protruding edge above the webcam that should help make opening the lid easier. The inclusion of the lip worked well during our tests and allowed us to open our test device with one hand. The hinges are also responsible for this, but they cannot prevent the screen from teetering back and forth slightly when we are typing. The display opens 180°, which should be wide enough for most people in daily use. In short, we liked the SF313’s design with its narrow bezels, which makes the device look modern and elegant. 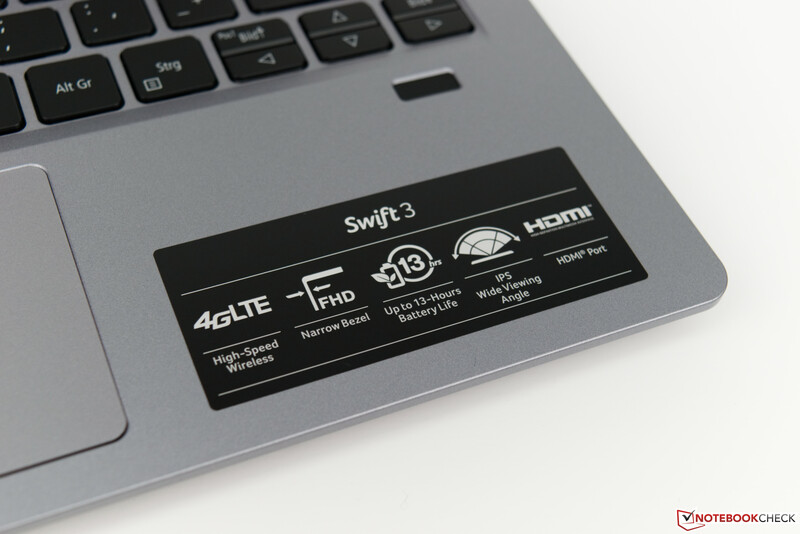 The Swift 3 SF313 measures 30.9 x 21.4 cm, which is slightly larger than our two ASUS comparison devices. The IdeaPad 320s-13IKB is roughly the same size as the SF313, but our two 14-inch comparison devices are predictably larger than our test unit. The SF313 also weighs 1.3 kg, which is heavier than all but the Honor Magicbook and the Swift 3 SF314 out of our comparison devices. It is worth noting that the SF313’s 45 W charger weighs 157 g, which is comparatively light for a 45 W charger. 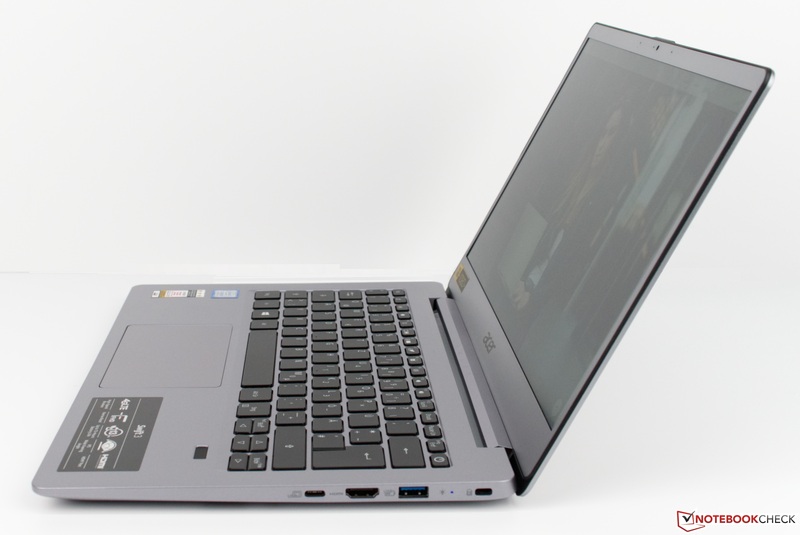 The SF313 is a well-equipped 13.3-inch subnotebook. There are three USB ports, of which one runs at the slower 2.0 standard. The other two ports are both USB 3.0, but one is Type-C, which is a welcome inclusion. 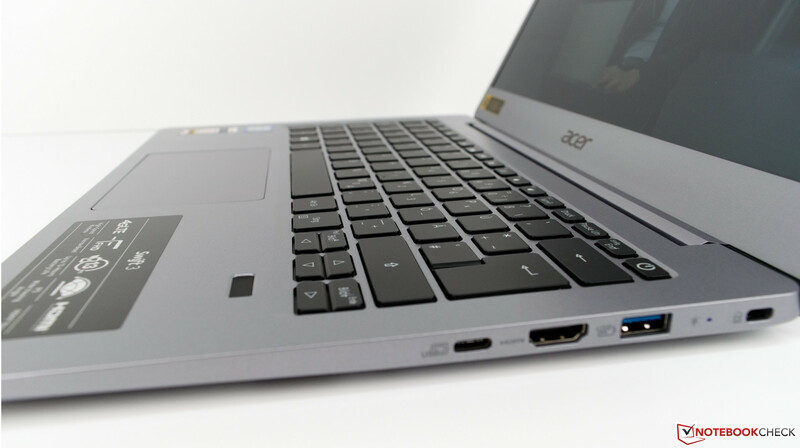 You can connect the device to an external monitor either with the HDMI port or via USB Type-C thanks to its support for DisplayPort. You could also use a Type-C to HDMI adapter if you preferred. There is a microSD card reader on the left side too, which can only be opened with a SIM tool. We see this type of card slot regularly on smartphones, but its inclusion here feels like a misstep. The purpose of putting a microSD card in a smartphone is generally to expand its memory, so it can sit in a locked card slot as it will not need to be regularly removed. However, a microSD card is generally used to transfer files to and from a laptop, so it is more useful to have an opening into which a microSD card can be inserted and removed quickly without the need for a tool. 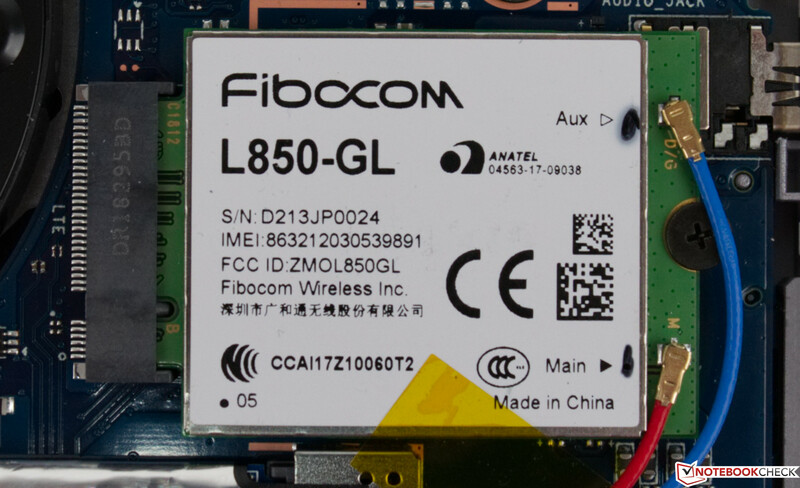 The port also holds the SIM card for the SF313’s LTE connectivity. 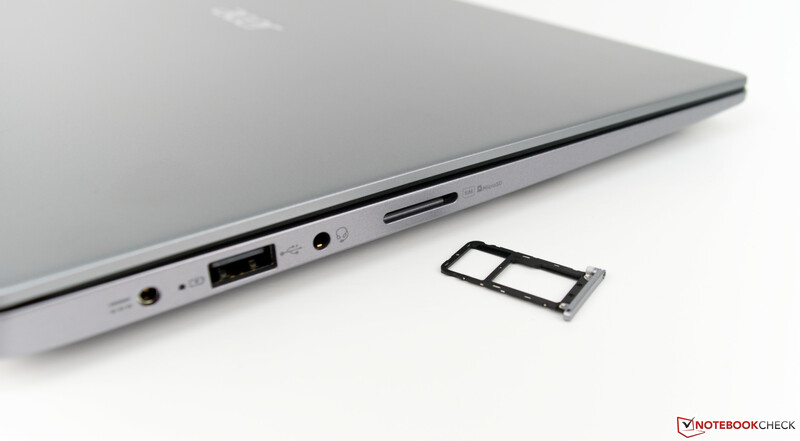 Overall, we would have preferred dedicated card slots as it would be easy to get caught out if you cannot remove or insert a microSD card because you do not have a SIM tool or a pin to hand. 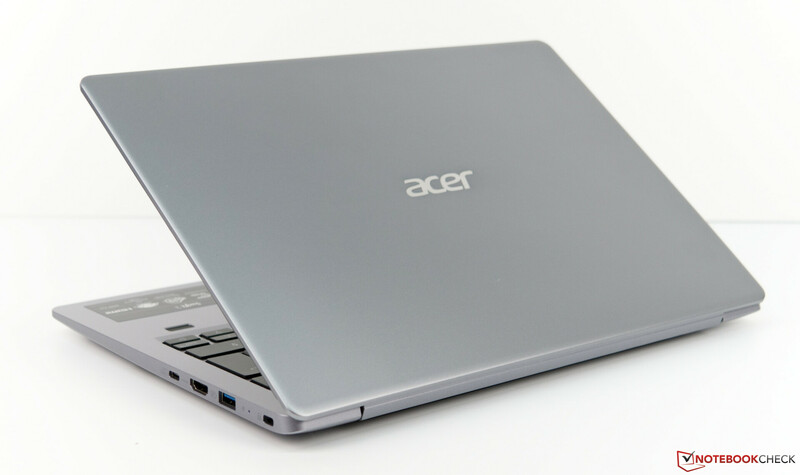 Acer equips the SF313 with an Intel Dual Band Wireless-AC 7265 Wi-Fi modem. The 7265 also integrates Bluetooth 4.2. Our test device achieved decent results despite being equipped with what it is now an old Wi-Fi card. The SF313 averaged 628 Mb/s in the iperf3 Client (transmit) test, which puts the device third in our comparison table. 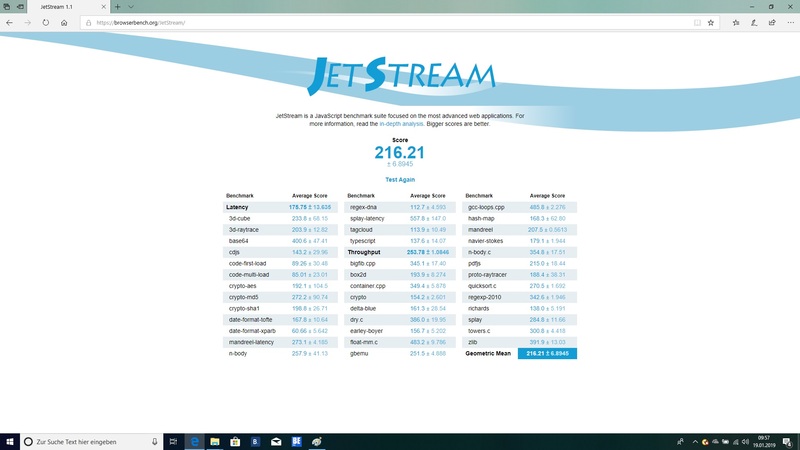 It also averaged 536 Mb/s in the receive test, which leaves the SF313 in fourth place and 137 Mb/s behind the ZenBook 13 UX333FA in first place. As mentioned previously, the SF313 has an LTE modem should you need Internet connectivity where there is no Wi-Fi. Unfortunately, the subnotebook does not have an RJ45 LAN port, which could have proven useful in an office. You could always use a USB adapter if you need a wired Internet connection though. Acer has included a fingerprint sensor on the SF313, which you can use to unlock the device once you have added your fingerprints within Settings. There is also a lock slot on the right-hand side of the case and a trial version of Norton Security should you not feel content with just Windows Defender. 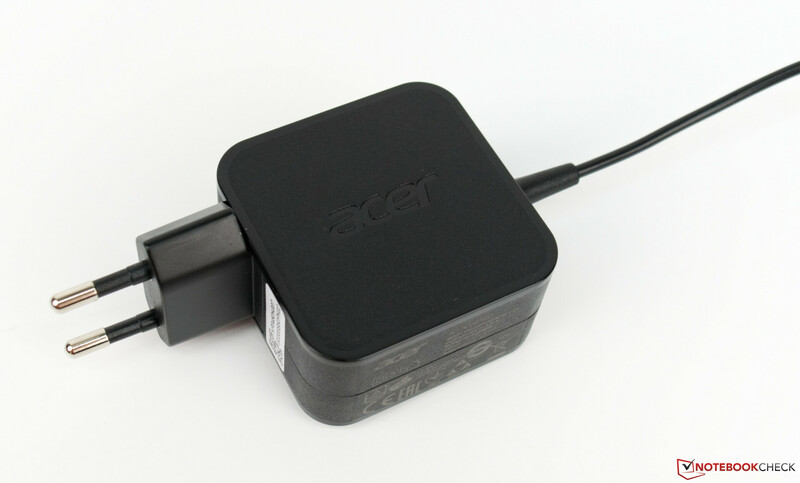 Acer only included a 45 W charger and some literature about the SF313 including the warranty information with our test device. It would have been nice had Acer included a USB to RJ45 adapter in the box, but these can be bought cheaply from a range of third-party manufacturers. The SF313 is easy to repair and maintain, although there are few components that could be replaced. While the subnotebook has no maintenance cover, the internal components are accessible by loosening a few screws from the bottom case and carefully prying the cover from the plastic clips that keep it secured to the case. We would recommend using a plastic pry tool to do this as the clips are easy to break. 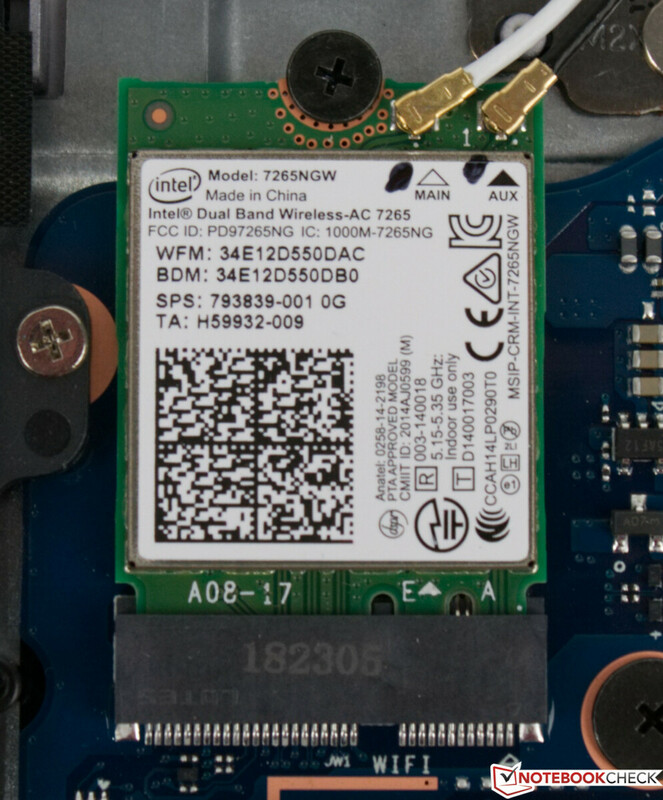 Removing the bottom case reveals the battery, the Wi-Fi card, the LTE modem and the SSD, which is hidden beneath a foil shroud. You can also easily clean the fan and heatsink should you need to do so. The RAM is soldered to the motherboard though, so there is no way to add more RAM to the SF313 in the future. 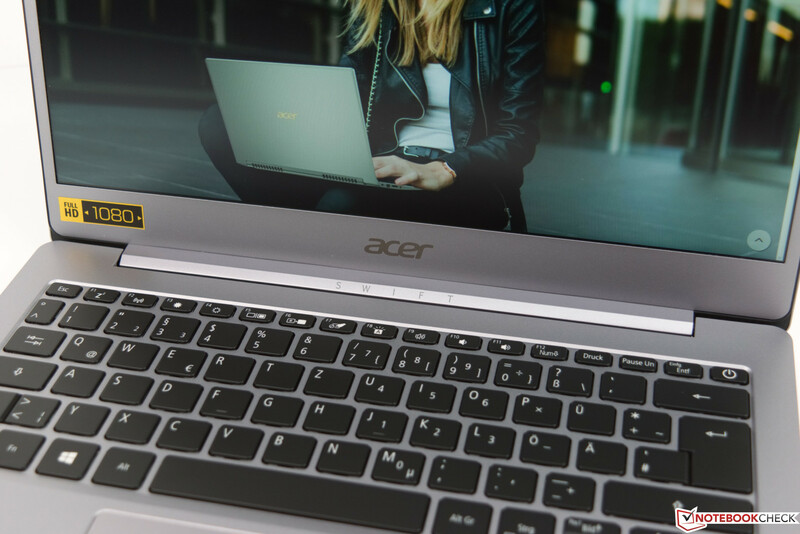 The SF313 comes with Acer’s standard 24 months warranty, which includes a send and return warranty service, rather than Acer engineers coming to your address to fix the device. You will also receive third-party warranty if you buy the subnotebook from a reseller like Amazon. Please see our Guarantees, Return policies and Warranties article for country-specific information. … and with its backlight switched on. The keyboard is well integrated within the base of the SF313 with all keys sitting level with the palm rest. The keys measure 16 x 15 mm, which is comparatively large for a 13.3-inch subnotebook. The keyboard is also laid out cleanly, although we are not fans of its half-sized arrow keys. This is a common complaint with many laptops though and not just subnotebooks. The black keys also stand out nicely from the silver case and the white lettering is clear. 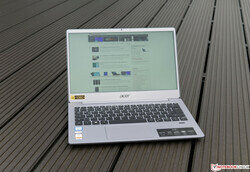 Acer has included a white keyboard backlight too, but this can only be cycled on or off. There are no multiple levels of backlighting like we have seen on other laptops. The keyboard is easy to type on thanks to the keys' crisp pressure points and pleasant travel. The keys are also grippy, which helps keep typing noise to a minimum. We did notice the keyboard deck flexing slightly as we typed though, as we mentioned earlier in this review. However, we hardly noticed this in daily use, and it should not be a problem even for frequent typists. 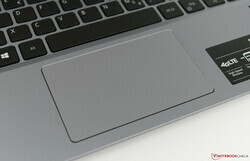 The trackpad measures 10 x 6.5 cm, which is a good size for a 13.3-inch subnotebook. There are no visual flourishes like a silver accent around the trackpad, but its colouring matches the colour of the case perfectly, while its smooth finish allows us to move the mouse around onscreen precisely. 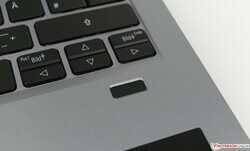 The trackpad worked well throughout testing and is accurate even into its corners. Acer has incorporated two mouse buttons too that respond with an audible clicking sound when pressed. 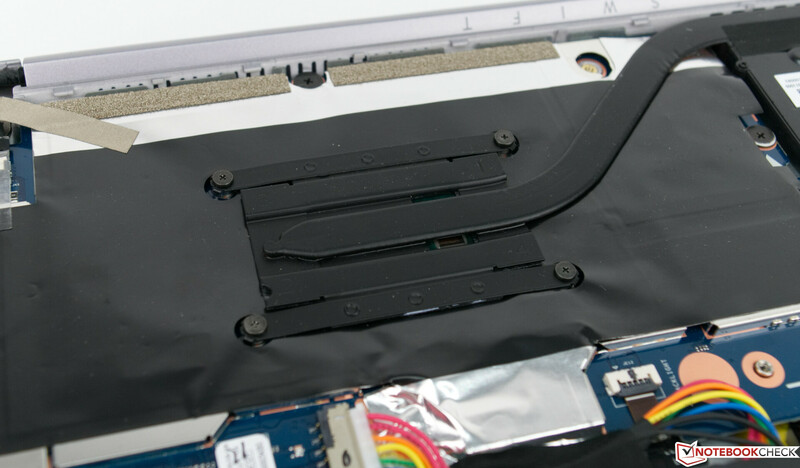 There is some play between the trackpad and its aperture within the case on our test unit, which causes the trackpad to rattle slightly. We suspect that this is a localised issue, but we would recommend checking for this issue with your device too. Unfortunately, our test unit suffers from noticeable backlight bleeding. 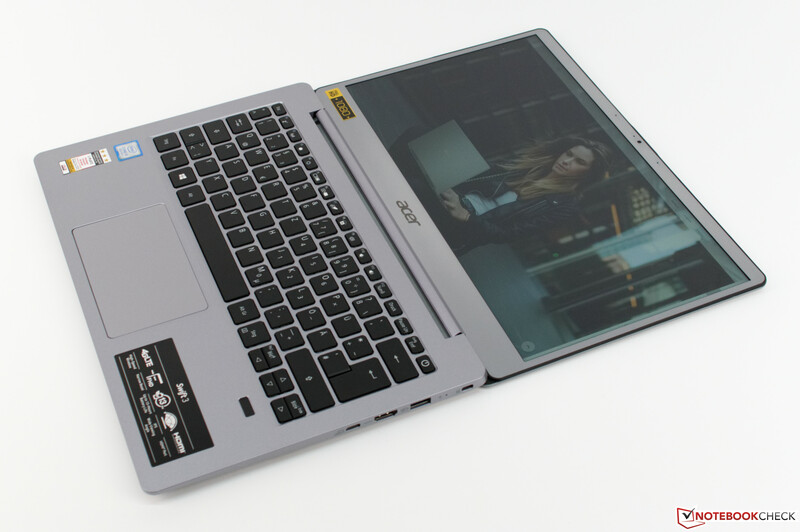 The SF313 has a 13.3-inch IPS display that has a matte finish. 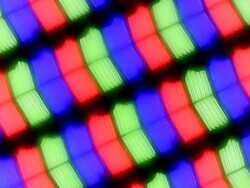 The screen operates natively at 1920x1080, which corresponds to a pixel density of 166 PPI. 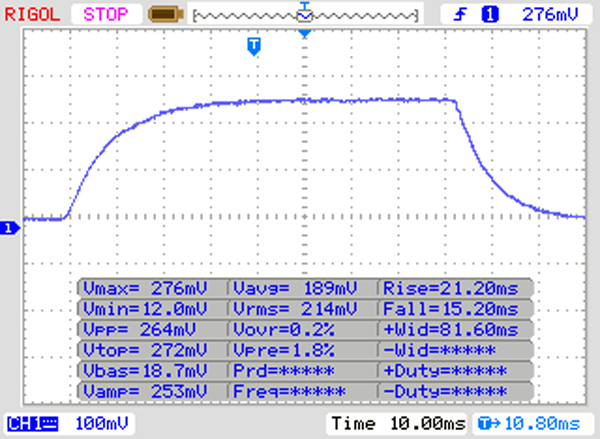 Our test unit achieved an average display brightness of 277 cd/m², according to X-Rite i1Pro 2. 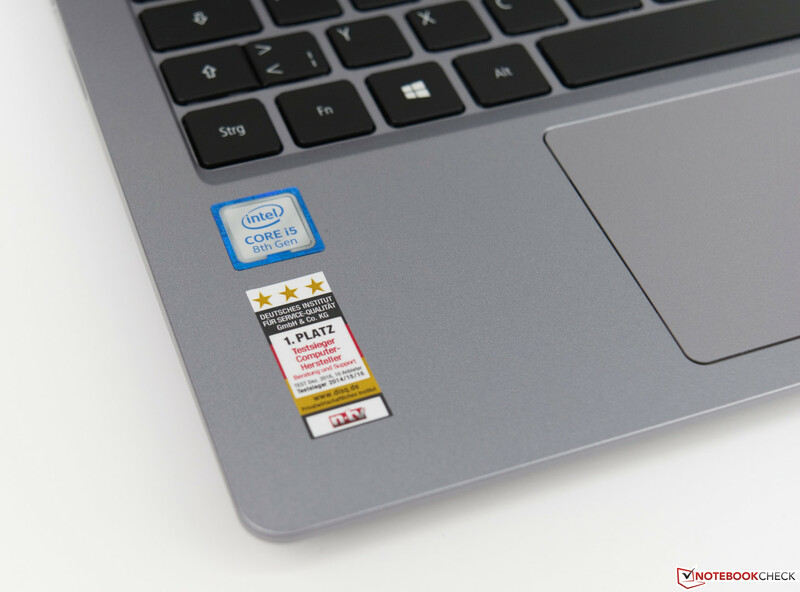 This puts the SF313 behind the IdeaPad 320S-13IKB of our comparison devices and on par with the Swift 3 SF314. 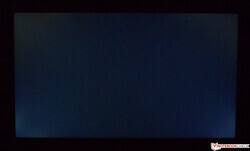 The SF313 has an 87% evenly lit display, which is marginally worse than most of our comparison devices. While the average maximum luminosity is rather low, the SF313 achieves a decent 1,154:1 contrast ratio thanks to its low 0.26 cd/m² black value. These values are in line with our comparison devices too, albeit the Honor Magicbook, ZenBook 13 UX333FA and the IdeaPad 320S-13IKB all have lower black values and higher contrast ratios than the SF313. 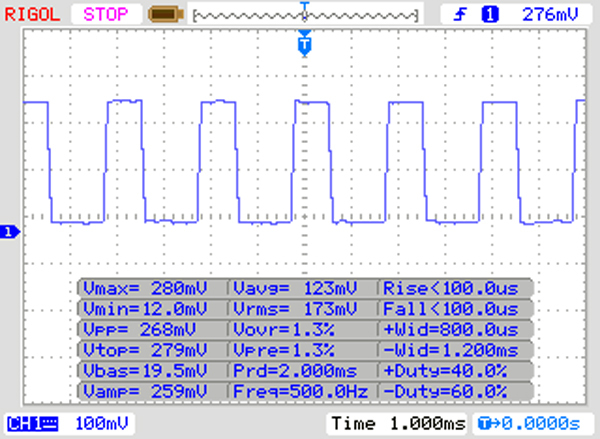 Unfortunately, the SF313 uses pulse-width modulation (PWM) to regulate its display brightness, which we measure at 500 Hz. This should not cause problems for even those who are PWM sensitive, but we cannot guarantee this. Moreover, the BOE NV133FHM-N62 display in our test unit suffers from noticeable backlight bleeding, which makes the corners of the screen look cloudy. We did not notice this in daily use except at night or in a dark room though, so it should not be an issue for most people either. 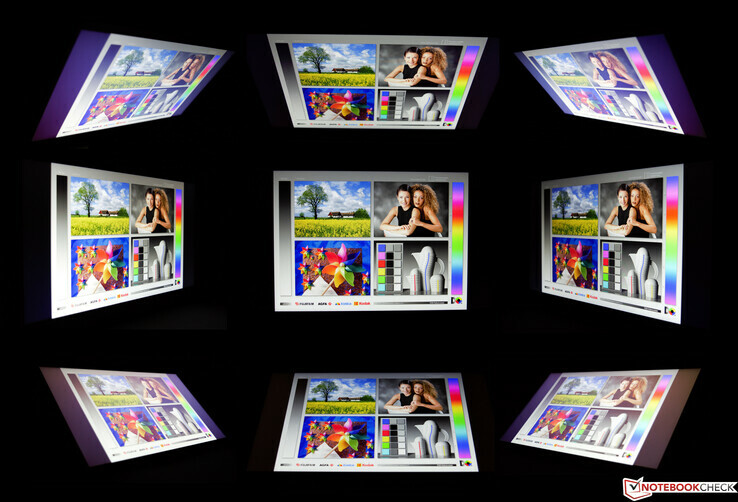 Colours look vibrant thanks to the SF313’s good contrast ratio. However, the display did not reveal its qualities until after we calibrated it. Upon delivery, our test device had high DeltaE 2000 deviations, which additional calibration reduced below the ideal value of 3. We have included our calibrated ICC profile in the box above our comparison table, but please only apply it to the BOE NV133FHM-N62 display as the profile may worsen your device’s colour accuracy if it has a different display. You can check what display and model number your SF313 uses in apps like HWiNFO. The SF313 also has decent colour space coverage, although some of our comparison devices provide better coverage than our test device. Our test unit achieved 88% sRGB and 57% AdobeRGB colour-space coverage, which makes the subnotebook accurate enough for hobbyist image-editing. It is not high enough for professional work though. The SF313 is relatively easy to use outside. Its matte display helps diffuse reflections and overcome its relatively low maximum luminosity. You may struggle to read the screen when using the SF313 under direct sunlight, but the screen remains legible on overcast days or in shady spots, as our photo to the right demonstrates. Our test device also has good viewing angles, as we have tried to show in the composite image below. Colours look washed out at acute viewing angles, but the screen remains readable. You should have no such issues when using the SF313 from normal viewing angles though. The SF313 is well-equipped and is powerful enough for most tasks, although it would struggle with resource-intensive workflows like video-editing. Our test unit is equipped with an Intel Core i5-8250U processor and 8 GB RAM, which is a common combination for subnotebooks released in the last year or so. You could also choose the Core i7-8550U version if you need more computing power, but its performance is not always that much better, as demonstrated by the graph below. The Core i5-8250U is a quad-core CPU with a 1.6 GHz base clock that can utilise Intel Turbo Boost for clock speeds up to 3.4 GHz when required. The processor also supports Intel Hyper-Threading that enables it to execute up to eight threads simultaneously. 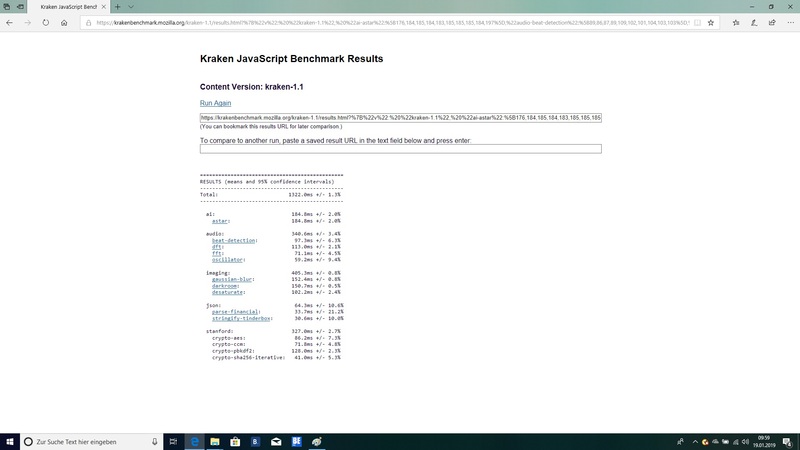 The Core i5-8250U in our test device performed slightly above average in our tests and significantly above the IdeaPad 320S-13IKB, at least initially. 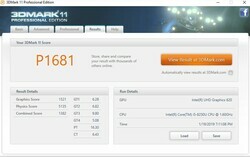 The VivoBook S13 outperformed the SF313 because of its more powerful Core i7-8550U processor. 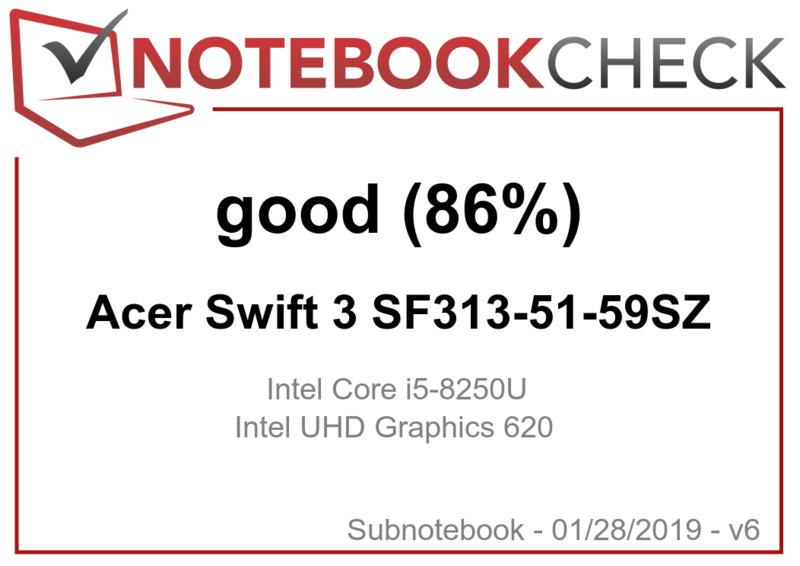 The SF313 fell just short of the equally equipped Honor Magicbook and ZenBook 13 UX333FA too. 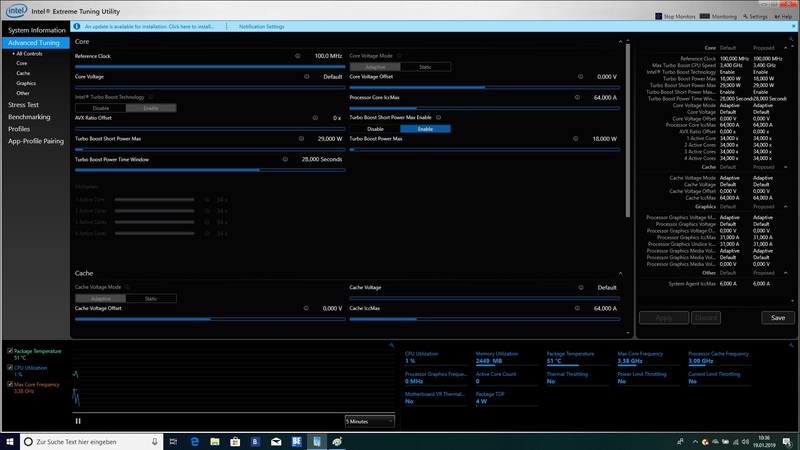 We subject all our laptops to a looped Cinebench R15 multi benchmark to determine how well they can maintain their performance under sustained load. The SF313 initially scored 576 points in the first run, but this steadily dropped on subsequent runs until it plateaued at around 450 points. 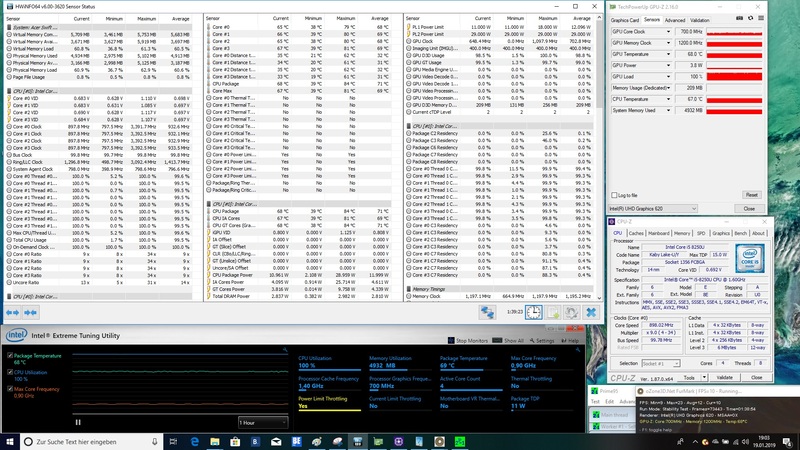 By comparison, the Honor Magicbook delivers more stable results, while the ZenBook 13 UX333FA throttles hard after its first run and drops from 595 to 508 points, at which point it levels off. Please see our CPU benchmarks page for more information about the Core i5-8250U and how it compares against other processors. 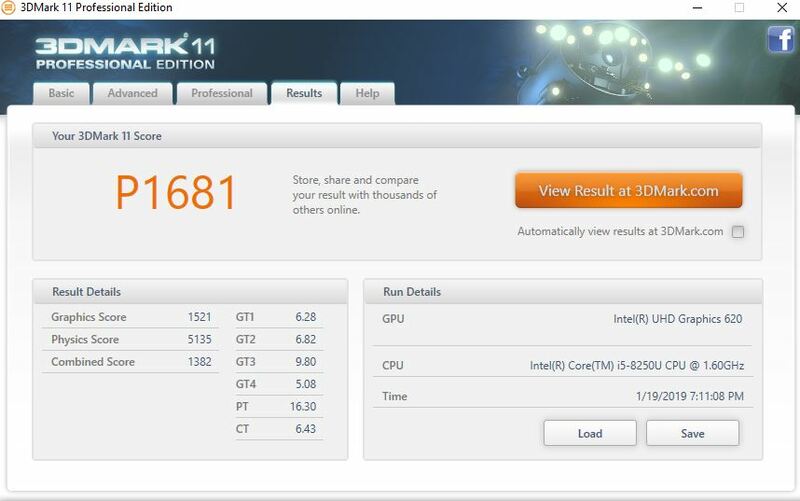 The SF313 has solid system performance and scored well in PCMark benchmarks. Our test device scored above average for its class and for the average of Core i5-8250U devices that we have already tested. The lead that the Core i7-8550U and the VivoBook S13 had in CB R15 is almost gone in PCMark. 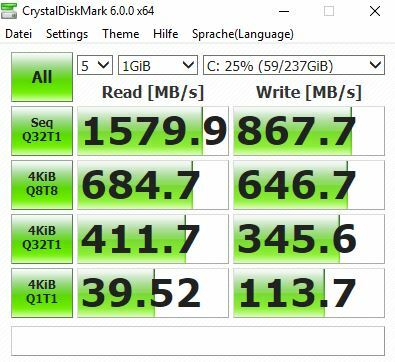 One big advantage that the SF313 has over most subnotebooks is its fast NVMe SSD, which ensures short loading times and a consistently smooth system. 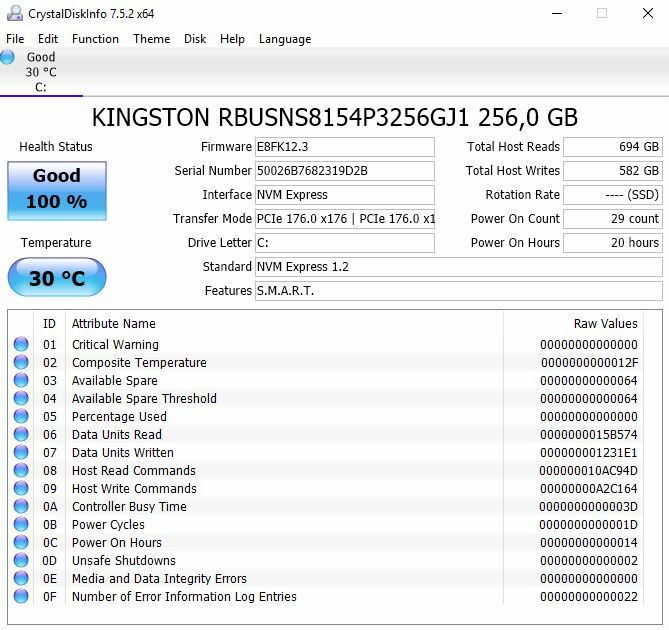 The Kingston RBUSNS8154P3256GJ1 256 GB SSD included in our test device. Acer has equipped our test device with a Kingston RBUSNS8154P3256GJ1 M.2 2280 SSD. The SSD uses the NVMe protocol to provide significantly higher transfer speeds compared to older SATA III SSDs. 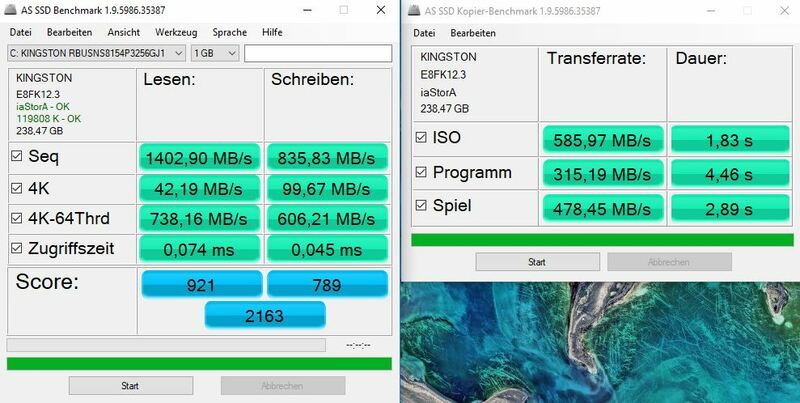 The Kingston SSD in our test unit is much faster than the drive in the VivoBook S13 and is marginally slower than the 128 GB version of the RBUSNS8154P3 in the SF314. 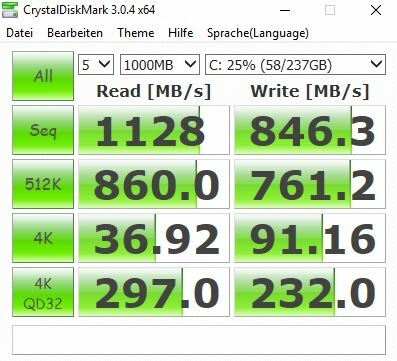 However, it cannot keep up with the Samsung PM961 SSD in the IdeaPad 320S-13IKB in the benchmarks that we ran on our devices. 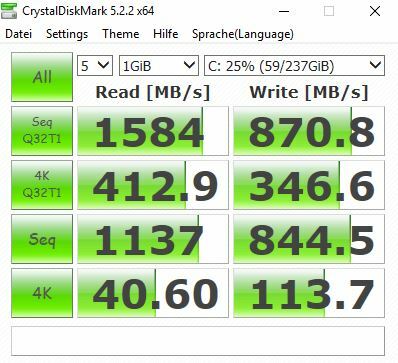 The Kingston SSD in the SF313 has good 4K read speeds though, which significantly speed up loading many small files. The SF313 does not have a second M.2 slot or a 2.5-inch drive bay though, so you must replace the SSD with a larger one if you run out of storage space. Since the SF313 does not have a dedicated GPU, people should not expect wonders when it comes to 3D performance. 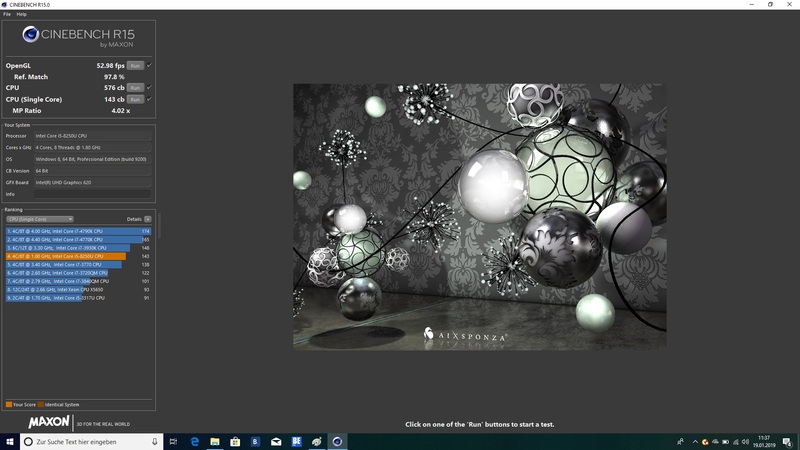 Comparing the subnotebook to the Honor Magicbook or the IdeaPad 320S-13IKB demonstrates the difference between the Intel UHD Graphics 620 and the Nvidia GeForce MX150. The UHD Graphics 620 performed well in our test device and is consistently above average thanks to the system operating in dual-channel mode, which helps the SF313 get the most from its GPU. The UHD Graphics 620 can decode the H.265/HEVC codec with 10-bit colour depth and Google's VP9 codec, which relieves the CPU of decoding high-resolution video. The UHD Graphics 620 is not powerful enough to render complex 3D games smoothly. Older and undemanding titles like BioShock Infinite and Rocket League are playable at 720p at minimal graphics. 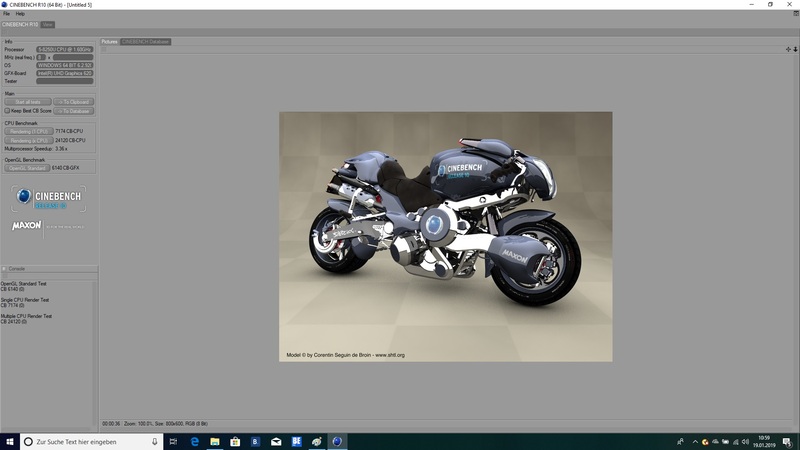 The UHD Graphics 620 also has no issues with rendering browser-based games either. The Nvidia GeForce MX150 is much better at playing games, by comparison. The SF313 has a single small fan to cool its components. 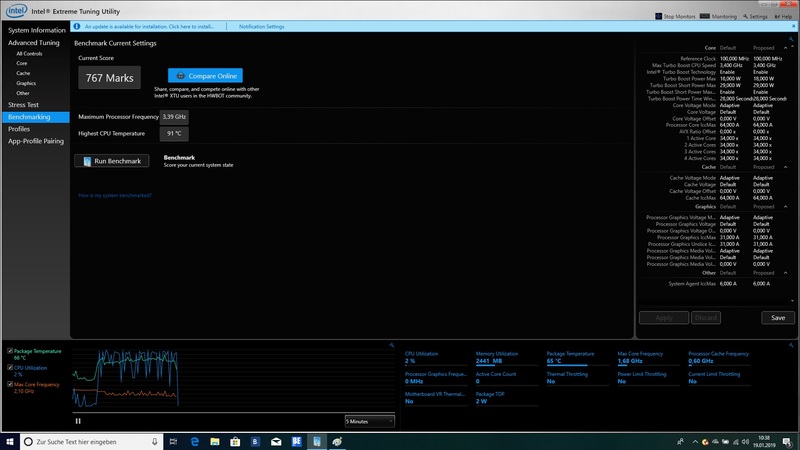 The fan is often silent at idle and only spins up to 30.7 dB(A) when we set the Windows 10 power mode to high-performance. The fan also reaches 34 dB(A) under sustained load, which rarely occurs in everyday use. It is worth keeping in mind though that the fan in the SF314 only reaches 31.4 dB(A), although the Honor Magicbook hits 43.8 dB(A), by contrast. The fan noise remained pleasant and did not sound shrill or high-pitched throughout testing. 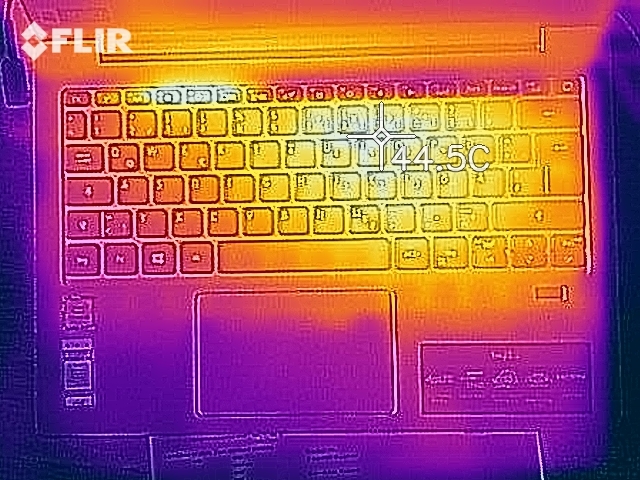 With exception to the Honor Magicbook, the surface temperatures of our comparison devices and the SF313 are broadly the same. 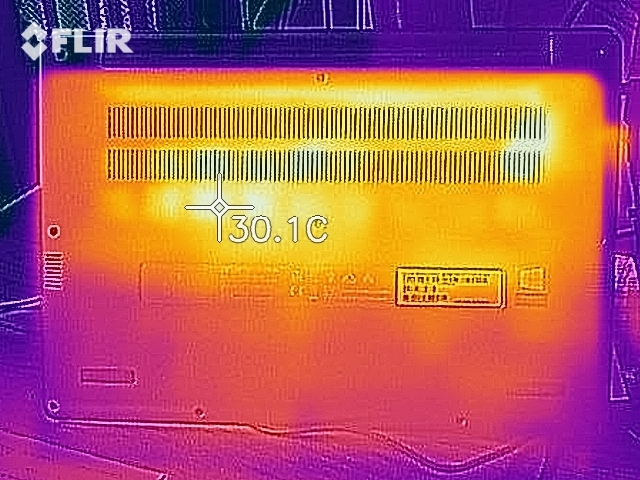 Our test unit heats up to 42.1 °C under sustained load, which is much lower than the 56.1 °C that the Honor Magicbook reaches. We also subjected the SF313 to a one-hour stress test to determine how it manages its internal temperatures when under sustained load. 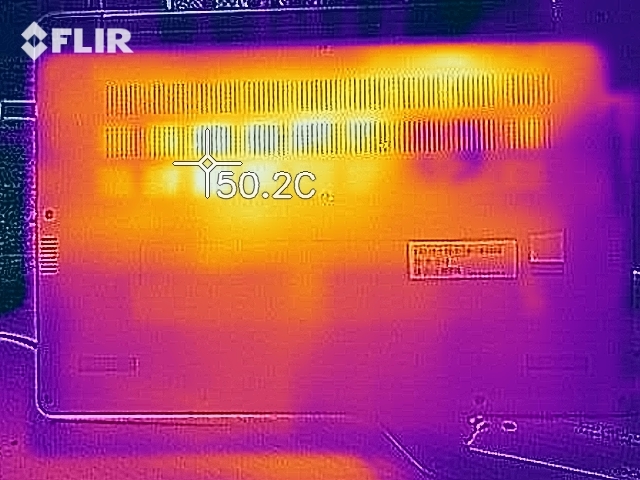 The CPU reached a maximum of 85 °C during our stress test but initially operated at 3.4 GHz before it heated up. The CPU then drops to 1.6 GHz when it reaches 80 °C to cool itself down. This helped the CPU to operate at around 70 °C by the end of our stress test. 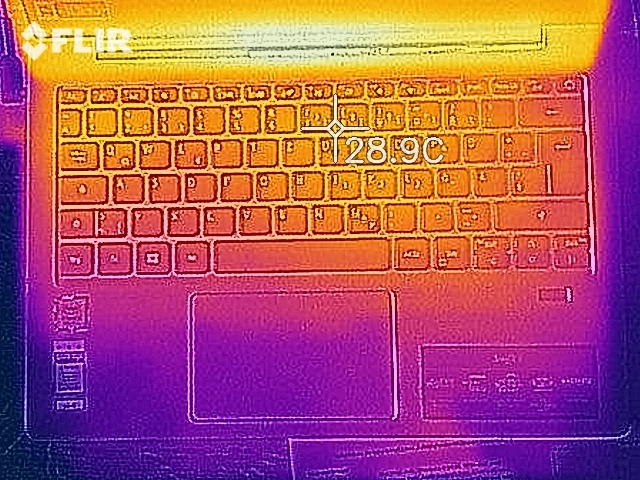 The FurMark stress test caused the GPU core temperatures to rise to 68 °C. 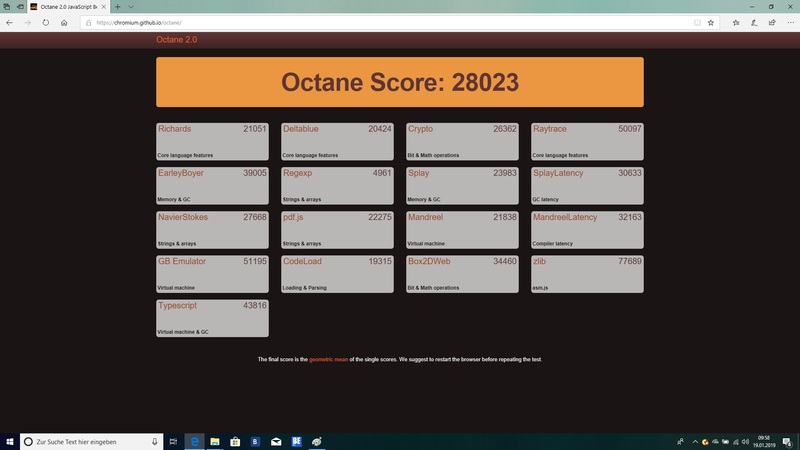 The GPU averaged 820 MHz during a FurMark stress test, but this dropped to 700 MHz when we ran FurMark and Prime95 simultaneously. 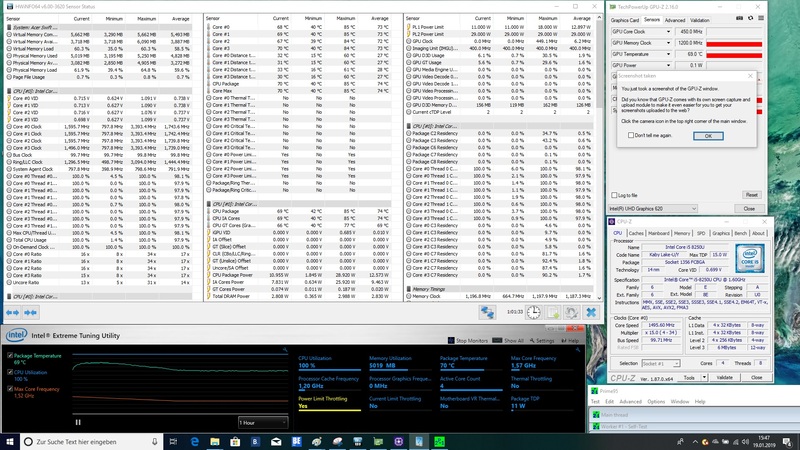 The CPU also downclocked to 900 MHz during this combined stress test as the CPU and GPU share the same TDP. 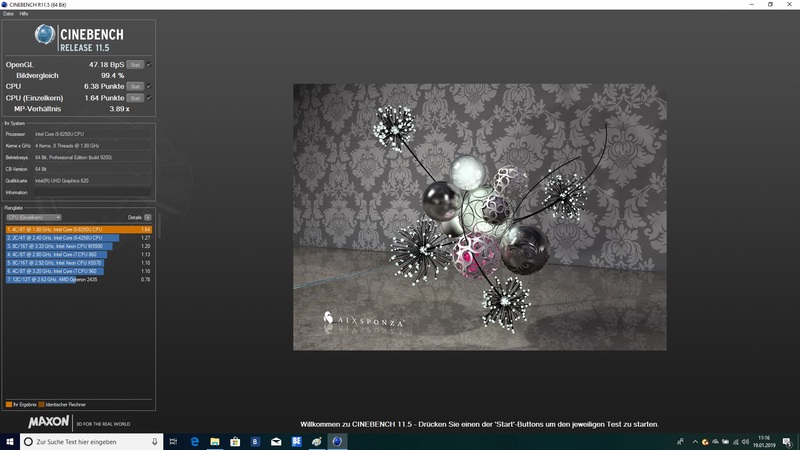 It is worth noting that our stress tests caused 3D performance to drop slightly until the device had cooled fully, which we confirmed by running 3DMark 11. The SF313 has two small downward-firing speakers, which results in audio sounding rather muted when the device is placed on a soft surface. The speakers deliver clear sound, but they lack bass, although that is a problem with many laptops speakers. In short, the speakers on the SF313 are good enough for video-calling or for streaming music and video. We would recommend connecting external speakers or headphones via the 3.5 mm jack or Bluetooth for a better listening experience. The SF313 is an energy-efficient subnotebook. 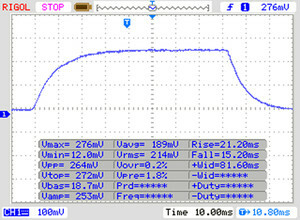 Our test unit consumed a minimum of 3.4 W at idle and averaged 8.8 W, which is higher than the power consumption of our comparison devices. Our test unit consumed a maximum of 42 W under load, which is on par for the average of UHD Graphics 620-powered devices that we have already reviewed. The SF313 also consumes only slightly more than the SF314, despite the latter being less powerful on paper. The SF313 does benefit from not having a dGPU though, as demonstrated by how much the IdeaPad 320S-13IKB and the VivoBook S13 consume. The 45 W power supply should be powerful enough to recharge the device even if it is pushed hard.